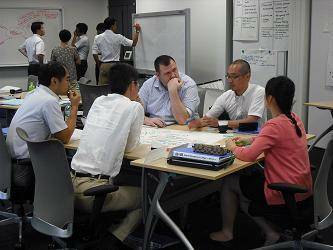 MOL Global Management College topics encourage innovative thinking and lively discussion. Cultivating next generation of leaders from head office and overseas subsidiaries, promoting management skills to drive future innovation. Mitsui O.S.K. Lines, Ltd. (MOL) announced that the company launched a program on August 4 to train candidates for the next-generation of executive management, targeting employees who work in MOL Group companies all over the world. The participants of the “MOL Global Management College” totaled 20, including eight national staff from subsidiaries and 12 from the head office. MOL’s business fields have been expanding in step with economic globalization. This program helps participants from all over the world acquire the management skills to demonstrate their leadership on the front lines of business and to become a driving force for innovation. The program will also promote a sense of unity among the participants by building awareness of problems and shared MOL Group values that transcend differences in business divisions, nationalities and cultures. The program is divided into three terms in August, October and December. The curriculum covers MOL business and operations in the head office, the midterm management plan “STEER FOR 2020”, and initiatives on safe operation, as well as various lectures and workshops related to management and leadership skills. The participants will also develop a proposal to promote the further growth of the MOL Group and present it to top management in the final term. In addition, the program allows the participants to utilize the personal networks they develop during their study and share ideas between course terms even after they return to their individual worksites.